It used to be that business people far and wide wore ties to work and way back in the past people even wore stovepipe hats. 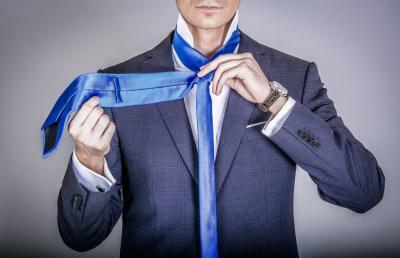 Choosing the right style of tie to go with a good suit demonstrated power and authority. Enter the power of the casual tech world, the millennial in the workplace and casual days becoming casual weeks, and the tie has largely disappeared. These days, it is estimated only 10% of workers wear a suit every day, 12% wear a tie and no one wears a stovepipe hat. These days it finally seems even the financial industry is starting to follow the business casual trend. Executives no longer need to wear a suit to work every day. Top companies such as JPMorgan, BlackRock and even PwC have embraced business casual. Certainly, a lot of do's and don'ts remain that are dependent on whether employees have client contact, but things are changing quickly. So, if a banker stays in the office far from the customer, business casual is perfectly acceptable. Meanwhile, BlackRock allows jeans and short sleeve shirts in certain locations. Even auditors and accountants from PwC follow the "dress for your day" approach depending on customer contact. This new approach also goes well beyond appearances. It is a good tool to attract young millennial employees who feel less comfortable in a suit. It tells the prospective employee that they are entering a more trendy industry than expected. Recent research from OfficeTeam shows that almost 33% of office workers would rather work for a company with a business casual dress code. In a 2016 study done by the International Foundation of Employee Benefits Plan, almost 50% of work places have a business casual dress code and 22% offer casual dress every day of the week. From a business perspective, consider tech titan Mark Cuban, who sent an email to the employees of his company. He told them to copy his casual dress at work, after getting advice to "wear what your customers wear to work." Personal comfort is one thing, but making customers comfortable is more important when you are trying to get more business or deepen relationships. People like doing business with people they can relate to. Clothing can help bridge bankers with small business customers, so this should not be taken lightly. When your team meets prospective clients at technology firms or younger small business owners, are you projecting formality and stiffness or are you less formal and seeking to make them comfortable? CEOs like Mark Zuckerberg, Steve Jobs and others all made business casual cool and it is now seen as acceptable for all levels of management. Experts will tell your customer facing teams the best thing to do every single time is to look at yourself and your value proposition through the eyes of the customer. If the customer sees a stiff person still wearing a top hat back in the day, is this someone you want to do business with or someone hanging onto the past? Continually look at promising customers from the perspective of a new economy to gain added advantage. Business casual is not new, but it may be for many bankers out there. It is also difficult to find the right balance between staying business enough vs. becoming too casual. To test the waters, start by visiting your customers and see what they are wearing. Then, ask yourself if they want to see you walking in wearing a tie/stovepipe hat or looking more like them. Lastly, be sure to have up-front communication throughout the bank on dress code requirements and expectations. Who knows - maybe it really is time to put away that tie/stovepipe hat and get into the trends happening all around the bank. Yields virtually unchanged as a result of mixed economic news on labor market conditions, housing and economic expansion. Research by the Society for HR Management finds 55% of HR professionals said they had trouble in particular with recruiting highly skilled employees. Research by Statista finds the share of mobile banking users among mobile phone owners in the US has reached 51% this year vs. 29% 5Ys ago. That amounts to about 76% growth over the past 5Ys. Fed research finds the number of community banks with assets above $300mm has doubled since 1995. Research by EIA finds the age of commercial buildings in the US by time period constructed are: built between 1980 and 1999 (32%), 1960 to 1979 (24%), 1920 to 1959 (20%), 2000 to 2012 (18%), and pre-1920 (6%). A TechCheck survey finds 75% of people write 3 or fewer checks per month. Research by the Census Bureau finds the median 25 to 29Y old spends 27% of their income on housing vs. 21% for the median 45 to 64Y old. Log-Rhythm research finds up to 70% of data breaches are detected by 3rd parties rather than by organizations' own security teams. Business Insider research finds the average millennial exchanges 67 text messages per day on average.